Cambie dress | More blue fabric? Sometimes you find a fabric that you fall in love with, but you don’t know whether or not you’ll use it (and it’s pricey…) so you leave it. And go back and look again. And so on, until eventually, one day, you buckle and buy it, just in case. And then it sits in your stash a while longer, and then you find out that the delightful Gabby is getting married and there is really no better fabric to make a dress to wear to her wedding with than that rather special fabric. A DRESS WITH UNICORNS ON IT! The fabric is Riley Blake Unicorn fabric that I bought in Guthrie and Ghani. The lining material is a blue chiffon that I got from Sayeeds (?) in Walthamstow. Uh, the fact it is unicorn fabric?! That aside, I really like this pattern, it fits me well and the sweetheart neckline is lovely. Having made it once before it came together really swiftly. I also got to discover the rolled hem setting on my overlocker when it came to sorting out the chiffon dropped hem. Chiffon is awful to cut out. So slippery and teeth gnashingly annoying. I’ve since heard a couple of hints that will make it a bit less painful should I go down that route again. I think so. 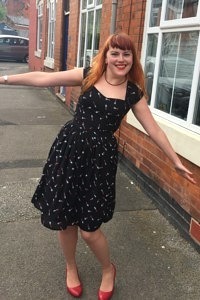 Like this it’s a great dress-up dress, whilst with a slightly tamer pattern it’s brilliant for work. And I haven’t even considered the fitted skirt variation yet…. I love gingham. It’s amazing and summery and makes me feel like holidays are just around the corner (almost certainly due to gingham dresses being summer uniform at school). 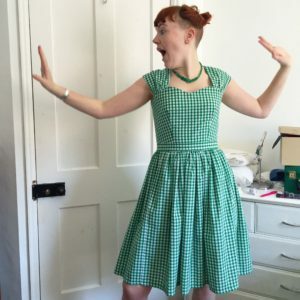 Coupled with the sweetheart neckline loveliness of the Cambie dress pattern, it was a match made in heaven, and to be honest, the main surprise is that it took me so long to make it! I really enjoyed the simple way that this pattern came together, and had a surprisingly good time trying to pattern match the gingham up. I didn’t have any faith in the description of the way that the skirt would gather up, but actually it was lovely and the pockets are a delight (seriously, who doesn’t love a dress with pockets? I had a nightmare getting the lining to attach to the bodice at the waist, and in the end I made the decision to leave it unattached except for a small section in the centre. It worked well and is definitely how I’d do this if I made another cambie without a skirt lining. 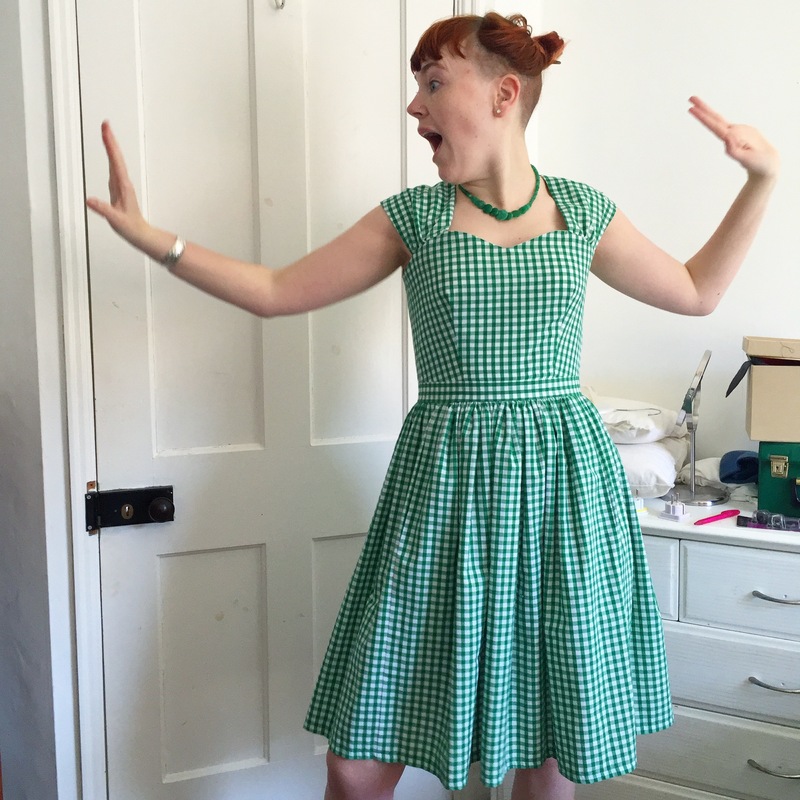 Yes as this was a wearable toile for the unicorn dress….